'Deep Currents' (Thomas Johnson, R. 2009). Seedling TX87A. TB, 36" (91 cm), Early-mid bloom season. Standards dark red-purple, cream centers heavily sanded red purple; style arms dark red-purple; falls cream, black purple bands and hafts, inner circles sanded and dotted lighter red-purple, short red-purple dart at end of smoldering burnt-orange beard; slight fragrance. 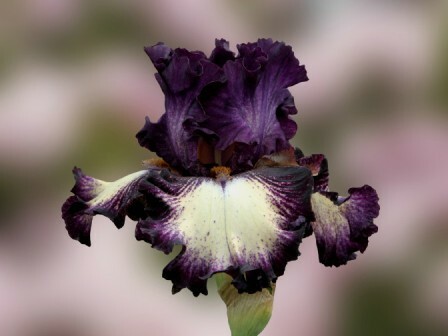 Seedling T134D: ('Silk Brocade' x 'Epicenter') X 'Gallery'. Mid-America 2009. Honorable Mention 2011. From Mid-America Garden catalog, 2009: DEEP CURRENTS (T.Johnson 09) TB Early-Midseason 36”(91cm). Deep Currents is beautifully formed with just the right amount of ruffles and a classy lilt to draw you closer. Standards are dark red purple with cream centers heavily sanded dark red purple. Cream falls have black purple bands and hafts with inner circles of lighter red purple sanding and dotting. Smoldering burnt orange beards end in short red purple darts. Stalks have three well-spaced branches and 8-10 buds. Sdlg. TX87A: (Silk Brocade x Epicenter) X Gallery. $50.00.